When a 20 foot statue is erected on stage during a number, only to be knocked down at the conclusion of said song, then can it be argued you have become an overblown parody of yourself? Apparently not, if you are Metallica. Theatricality has been a core virtue since the band’s inception and finds perfect expression in Metallica: Through The Never. Directed by Nimrod Antal, who brought us the visually stunning yet flawed Predators, Through The Never again plays to his strength of visual style. In addition to the concert we get the tale of the roadie, Trip (Dane DeHaan), as he is sent on a simple assignment during the show. However, as the show progresses, the walls of reality crumble and an apocalyptic vision walks the city (either Sutter Cane is Metallica’s lyricist, or the pill Trip takes before the concert was not purely medicinal). This thin plot is purely a vehicle for a nightmare vision of urban warfare and decay that Antal revels in. Initially the cuts to this storyline distract from the concert footage. 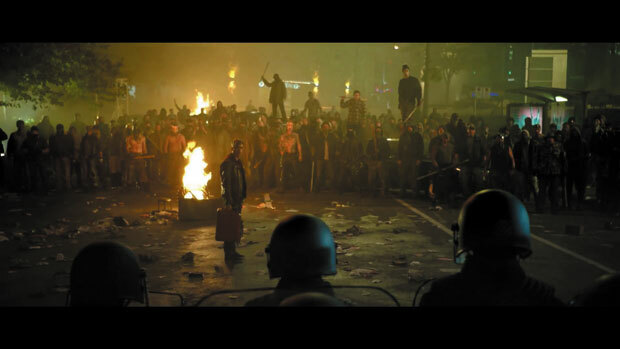 However, by the time of the riot sequences, the drumbeat of Metallica melds perfectly with the imagery of the police beating batons on riot shields. From here the two flow seamlessly together, the growl of Metallica fuelling the mayhem on the streets. To balance this dark urban fantasy, the actual concert is just as delightfully ostentatious. Poised on a stage that was seemingly designed by Cenobites to maim in spectacular and intricate ways, the band members stand encircled by the audience. Each member faces out onto one section of the crowd, save for Lars Ulrich who sits squarely in the middle of a mosaic of monitors, demonstrating their competent showmanship. James Hetfield howls his lyrics with the usual gusto; Kirk Hammett plays some of the most beautiful guitars known to man with obvious glee and Robert Trujillo spider-crawls across the stage in a strangely compelling parody of movement. Trujillo’s physicality is used to great effect for his introduction, as he crouches, playing in a circle of amplifiers, the sound visibly pulsing around him. These little special effect enhancements further meld the fantasy elements into the concert, corroding the barrier between the real and unreal, each member getting a quick but equally surreal moment. Between the computer enhancements, lighting, graphics, pyrotechnics and physical effects, no effort is spared to drown the audience in spectacle, and they obviously appreciate it in kind, responding with raw energy and emotion. Consistently in danger of collapsing into pretentiousness, Metallica: Through The Never somehow manages to stay the course and produce a riveting concert experience. Buoyed by a strange alchemy formed by the director’s vision, the band’s impressive body of work and the sheer enthusiasm of the crowd, this one apparently does go to 11. I would like to clear up some confusion about the statue that collapses. The song the band is playing during this scene is called “And Justice for All” and it is the title track to their 1989 release. When they were touring in support of that album, they would play “AJFA” and, during that tour, the same thing happened – the crew built “Doris” or “Lady Justice” and then, at the song’s conclusion, Doris would “blow up” and, actually, the lighting rig would swing down. I have a bootleg VHS tape of their Buffalo, NY, show during this tour and that’s what happened. I haven’t watched the 1989 Seattle concert from the “Binge & Purge” box set in a while, but I think it is shown during that show. So that’s the story with the statue. I saw the movie last night – I was the only one in the theater – and that was good, b/c I air drummed nearly the entire concert!